Here's something I made early last year for a little baby boy. 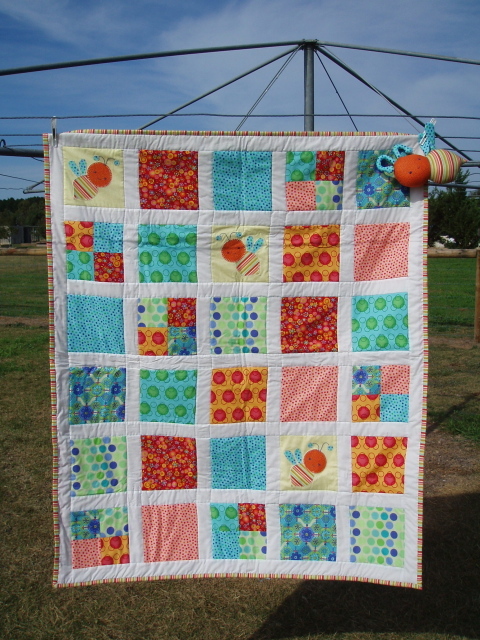 It's called 'Bumble Bub' and is a cot quilt or playmat and also a softie bee toy too. 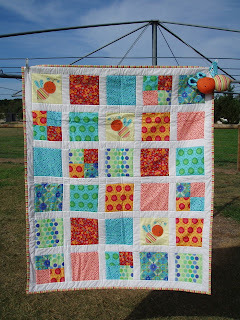 It's a Melly & Me design from her Kaleidoscope book and only the third quilt I've ever made. I do love the fabrics I used in it and it has simple piecing and some machine applique so was fairly simple to put together. I also machine quilted it in the ditch - as that's really all I could do on my machine at the time. I would have liked to quilt it differently, so this year I plan to learn more quilting techniques and styles. The reason I thought I'd show you this quilt is because I am using some of the fabric I used in this quilt in a new design I am working on at the moment. I won't give too much away yet - but I am really happy with the way the design is all coming together and am just loving the fabrics I'm using in it. So stay tuned as I'll post a picture of the new design very soon. Looks fantastic Jody cant wait to see your surprise. Love it!! Love the colours...don't keep us waiting too long! It is very attractive and I really look forward to seeing what you prepare us but it is sure, that is going to be magnificent, I already know it! Kisses and good week. These fabrics are gorgeous, I look forward to seeing what you come up with, I'm sure it will be fabulous.